Brazil scored at the start of the first half, at the start of the second half, and in the final minute. Luiz Felipe Scolari named his expected side, unchanged from the XI that defeated France 3-0 last week. Alberto Zaccheroni left out Ryoichi Maeda, using Shinji Okazaki as the lone striker, with Hiroshi Kiyotake playing on the right of midfield. Brazil got off to a tremendous start through Neymar’s brilliant strike from the edge of the box and controlled the majority of the game. 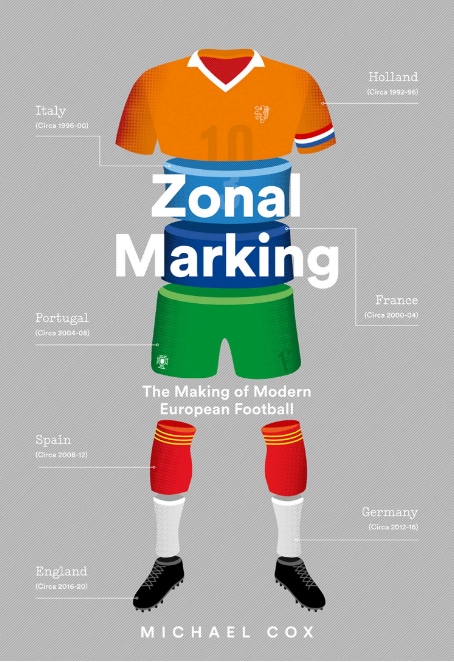 After a quick start to the contest, this slowed down into a much slower game, partly because Brazil had taken an early lead, and were often content to retain the ball in deeper positions – much to the crowd’s annoyance, at times. This was also a slightly odd tactical battle – while this is technically a competitive tournament, the sides generally treat the Confederations Cup primarily as a warm-up for the World Cup. Managers focus more on developing cohesion in their own side than reacting to the opposition – which often results in enjoyable, open games of football. In recent years, there have been two distinct types of classic openings to international tournaments – either a stunning underdog triumph (Senegal v France 2002, Greece v Portugal 2004) or an opening goal for a jubilant host nation (Germany 2006, South Africa 2010). This was the latter – Neymar looks set to be Brazil’s main man next summer, the attacker who possesses the individual skill to compensate for Brazil’s lack of a world-class number nine, or a classic number ten, and his long-range, rising shot was a great way to start this tournament. The nature of the goal meant it was something even more significant than a moment of pure individual brilliance, however. The chest lay-off from Fred was basic, but it demonstrated exactly why he’s playing upfront – to provide a central target for crosses, and to knock the ball down for oncoming attackers from deeper positions, especially Neymar. At Santos, Neymar generally cut inside from the left to link up with a classic number nine (most obviously Ze Eduardo) - it feels like he depends upon a static, functional number nine to occupy defenders. It’s also worth noting Marcelo’s driven cross – left-back is one of the few positions up for grabs at the moment, with Filipe Luis also a contender, but Macelo performed well throughout this match. From then, Brazil seemed happy to retain the ball in deep positions. With Neymar’s goal arriving after just three minutes, it’s difficult to know whether Brazil were planning this type of football anyway, or whether it was a reaction to the goal, to calm the tempo and establish their superiority. With Okazaki and Keisuke Honda dropping off and preventing Brazil’s centre-backs playing passes into the two deep midfielders, Luiz Gustavo dropped into the back to create 3 v 2 situation, which ensured possession at the back but often didn’t enable Brazil to pass the ball through the centre of the pitch. With the Brasilia pitch cutting up badly, lateral balls were dangerous and Brazil conceded possession too frequently when passing the ball out wide to Marcelo and (in particular) Dani Alves. 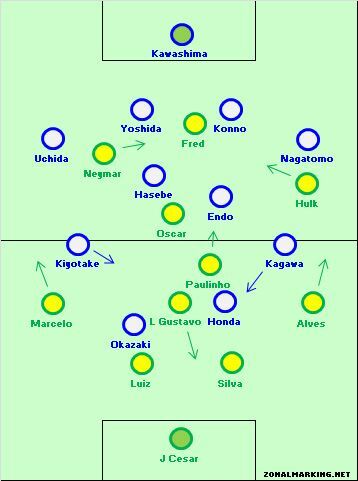 As a result of Brazil’s poor passing, Japan often won possession in dangerous positions and immediately broke through their attacking quartet – although it was frequently only the attacking band of three contributing, with Japan’s weakness upfront evident from Okazaki’s minimal contribution. His lack of goalscoring is well established, but in this match he didn’t show great movement or link-up play either – and those factors are arguably more important for a side possessing three talented attacking midfielders. There were a couple of bright counter-attacking moments from Japan – Kiyotake is the least famous of the three attacking players and was substituted shortly into the second period, but he created three chances and demonstrated both good crossing ability, and an eye for a clever through-ball. Scolari will be concerned his side was so prone to counter-attacking, despite the use of two deep central midfielders. An obvious tactic from the Brazilian defenders was to stick extremely tight to opponents – when Okazaki dropped deep he was often tracked closely by David Luiz, while Thiago Silva was also seen moving high up the pitch, almost into the midfield zone, and Alves fouled Kagawa midway through the first half, in a position closer to the opposite touchline than to his natural right-back zone. This was surprising given that Brazil defended deep for long periods – Scolari could be seen imploring his players to push up higher. When Japan did find space in dangerous positions, they shot from long-range. This is unquestionably one of their strengths considering their midfield options – although it’s also a Brazilian weakness. This game was a nice summary of Julio Cesar’s skillset – he’s great at reaction saves, but less assured when dealing with long-range efforts. Japan’s defensive transitions weren’t impressive in this match, with both wide midfielders more concerned with attacking – this gave Brazil space in wide roles to attack directly. Both Neymar and Hulk had efforts cutting after inside onto their stronger side, with Alves and Marcelo providing overlaps when possible – although often the attacks flowed too quickly to make this movement decisive. The role of Oscar was particularly interesting – he’s not a typical number ten (indeed, he and Neymar have switched numbers – Oscar now wears 11) and the main feature of his game is his impressive tactical discipline and understanding of space. That was particularly obvious here, as the Chelsea midfielder spent much of his time drifting around the pitch, particularly towards the flanks when he spotted gaps in wider areas. In this sense, there was a similarity between Oscar’s role here and Mesut Ozil’s role for Real Madrid. Ozil plays alongside two inverted wingers (Cristiano Ronaldo and Angel Di Maria) who both repeatedly cut inside to shoot – Ozil makes exaggerated overlapping runs to maintain the width, and allow the wingers space to move into. Oscar’s role was very selfless, giving both Neymar and Hulk freedom to move inside – he also defended the left flank effectively when Neymar stayed forward, making as many tackles as any other Brazilian player. 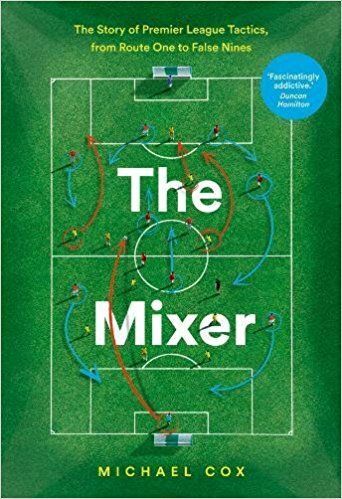 In this Brazilian system, the number nine and the number ten are very functional and unglamorous, designed to get the best out of the two wide forwards. In the end, Oscar actually provided a sublime through-ball for Jo’s late third goal – but this wasn’t typical of the role he played. Japan will be disappointed at their overall lack of control in the midfield zone, although they improved after half-time. An increased share of possession meant both Atsuto Uchida and Yuto Nagatomo could break forward – a key feature of Japan’s play in the Asian Cup victory of 2011. Uchida prefers to overlap, while Nagatomo likes cutting inside onto his right foot. Arguably, the way Japan reshaped towards the end of the first half (Kiyotake off, Maeda on to play upfront, and Okazaki moved to the right) – didn’t help the balance of the side. Uchida found it difficult to overlap Okazaki, while Kagawa’s drifts inside mean Nagatomo can’t do the same thing – but there was at least more variety in Japan’s play, with Maeda’s movement more dangerous upfront. Brazil’s second goal followed another drilled pass from the flank – this time Alves, from the right – and Paulinho popped up in the penalty box to finish. This was a relatively rare forward run from the midfielder, who generally stayed in position – although there’s a clear separation of duties with he and Gustavo, who plays much deeper and collects short balls from the centre-backs. At 2-0 Scolari made three changes – Lucas Moura for Neymar, Hernanes for Hulk and Fred for Jo. 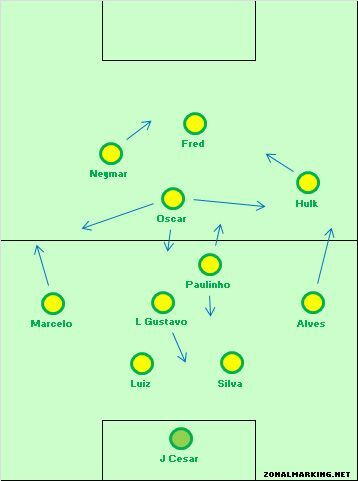 This made Brazil more of a 4-3-3 – Hernanes becoming the third central midfielder, with Oscar left and Lucas Moura right, either side of Jo. This made Brazil a little less direct and more based around ball retention, despite the third goal. Brazil weren’t exhilarating and could have moved the ball forward more quickly, but there was a lot to be optimistic about for Brazilian fans, with each section of the side appearing cohesive. The defence was solid enough, despite starting too deep, while the two midfielders both performed their duties calmly and efficiently. Further forward, Oscar played his role intelligent, and he and Fred helped Neymar’s favoured positioning. “My feeling is that we’re finding the best lineup,” said Scolari. In terms of individuals, the major question mark is Hulk on the right – he’s unstoppable at his best, but against top opposition, Scolari might feel the Zenit forward makes Brazil too one-dimensional. Lucas is a superior ball carrier from deep, while Jadson would play narrower and offer more creativity – although using either of these players might increase the pressure on Neymar. Brillant performance. Greate to see lads doing such a powerful perfo. Can someone explain to me why David Luiz is starting over Dante?? Dante has proved to be one of the best and most reliable defenders in Europe this season, having just won the treble. I think Dante + Silva would be a more solid pairing but Scolari must have other plans. Given how both of them have played this season I’d be surprised if Scolari doesn’t use the Dante/Silva partnership at some point in the world cup. Luiz can be a bit of a liability in central defence. David Luiz plays on the Brazil team since 2010 and is seen as defensively reliable. He has been captain when Thiago Silva didn’t played. He will probably be on the team next year, either as a CB or DM. I read an op-ed piece (can’t remember where or I would link it here) that said that Luiz is more comfortable bringing the ball out of defense and a good passer of the ball. Since Brazil’s midfield pivot is more functional and aren’t exactly great passers, he provides an option to start attacks from the back. Not sure how much I believe this since I’ve seen Silva play as a DM for Milan in the past and he seemed pretty comfortable on the ball then. I would like too see Brazil sacrifice one of the two DMs for Hernanes. Brazil would improve with better distributive qualities from one of those two positions. Hernanes and Fernandinho (not in the team currently) can give Brazil more quality in this regard. Luiz Gustavo and Paulinho don’t offer enough quality in possession. I’ve never thought the anchor/carrilero combination was effective- especially not in a side like Brazil with enough quality to do better. - Okazaki as central striker? He is doing well as pacey inverted winger at Stuttgart. - Kagawa as a left winger? His performances were at Dortmund as a number 10. Otherwise, Brazil looked lame in the first half, except the Neymar goal. No real idea what to do, just brute-force running and dribbling 1on1s, plus lots of crosses. I think the biggest concern for this Brazil team will be linking the ball from defense to their front 4. The CMs weren’t able to do much of this against a Japan team that sat back and did little to no pressing. Against a stronger opponent that presses higher up the field, I don’t see how Brazil will be able to build out from the back and through there CMs. Maybe they’ll be able to get by on building out through there attacking fullbacks, Luiz carrying the ball out of defense himself, or bypassing the CMs all together with longer balls into Hulk or Fred. Brazil will be exciting in the final third and they have some really good defenders to bail them out, but I think they’ll find it difficult to control the tempo of games when they come up against teams like Italy and Spain. Brazils midfield seems to be the weak spot. I thought their transitions from defense to attack was very poor. Also felt their midfield did not give enough cover to the defense. They were extremely lucky not to concede any even with Thiago Silvas brilliance. Second they really need someone better up front. Fred is good but nowhere close to being world class. Even with Del Bosque complaining about the 9 position Spain have much much better options. Maybe Pato or Leandro Damio ? At Santos, Neymar generally cut inside from the left to link up with a classic number nine (most obviously Ze Eduardo) – it feels like he depends upon a static, functional number nine to occupy defenders. Should do well at Barcelona, then! Given that Brazil is still searching for an answer on the right wing, it’s a surprise that Willian from Anzhi wasn’t called up, especially given that players such as Bernard and Jadson were brought in. Those two are fine players, but Willian is certainly a greater talent. In fact , I’d say that Willian is essentially a better, more established version of Bernard as they do a lot of the same things for their sides. Good call! It is really astonishing that Willians had little or no chances either with Mano Menezes or Scolari. Midfield is the problem for both Brazil and Argentina. I really didnt feel that Brazil had a good match, especially because Japan was too poor, played in a much lower level than what they are capable of. I think that the main lesson from this match was that in 2014, for the first time, a European team will win a South American World Cup. I just can’t understand why Brazil are having so many problems in midfield. Fernandinho, Leiva, Sandro, Fernando, Gustavo, Paulinho and Ramirez that’s a variety of quality players. Their should be no excuses, there’s a very good midfielder to fit every position and every style of play. I think think at the end of the day they are struggling for an identity and don’t have enough goal scorers. In fact most of the top teams in the world at the moment are struggling for a quality striker. Well, they’re good enough to put in a good showing, but they’re not Zico, Eder, or Socrates, nor for that matter Iniesta or Xavi, if you see what I mean. But after a couple of decades of discouraging creative midfielders, Brazilian football isn’t going to produce a genius in time for next year. I hope viewing the Spanish team live will get Brazilians to reconsider their approach. Women’s Tennis Association executive director and CEO Gerard Smith, whose phone calls to Seles went unreturned, announced “an inquiry” into her withdrawal and a $6,000 fine.